Denver Apartment Buildings For Sale website and Kyle Malnati’s Central Denver Apartment Market Report for 2Q2012 details Apartment Buildings Sold in Denver during the 4th Quarter of 2011 and the 1st Quarter of 2012. The statistics for Uptown Sales are 9 properties sold: Averages – $131.84/SF – $80,844/unit. The Uptown neighborhood of Denver is described by the following: Bounded by Broadway, Colorado Boulevard, 20th Avenue, and Colfax Avenue. 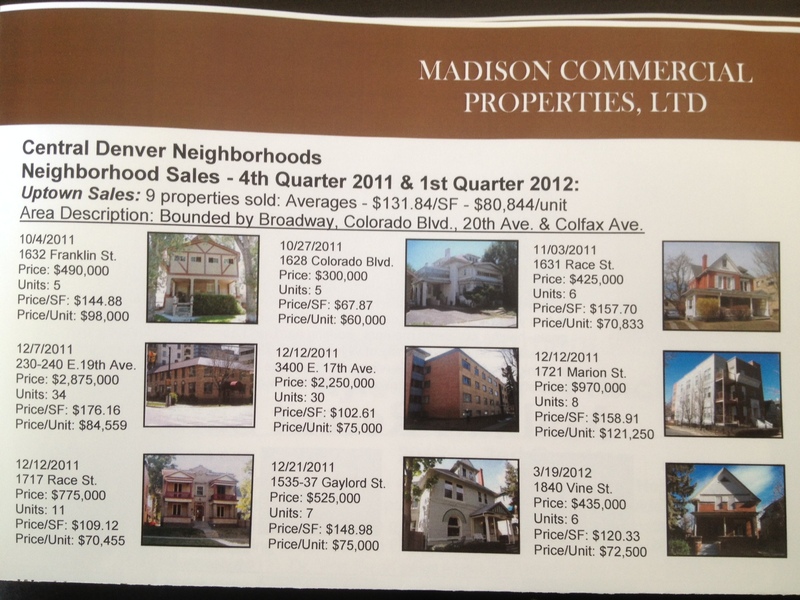 The detailed information about each apartment building sale can be found below or in my latest newsletter.